Optics questions with solutions and explanations at the bottom of the page. These questions may be used to practice for the SAT physics test. The questions are about reflection, refraction, critical angle, lenses, reflectors, light rays propagating through different mediums, refractive index of materials, ..etc. Which of the following is true about light? The speed of light in a certain material is 50% of its speed in vacuum. What is the refractive index of this material? What is the critical angle ic at the interface glass-cladding of an optical fiber whose core has a refractive index equal to 1.5 and cladding with a refractive index 1.45? Which of the following is true about light with a single wavelength? Parallel rays of light strikes a convex lens. 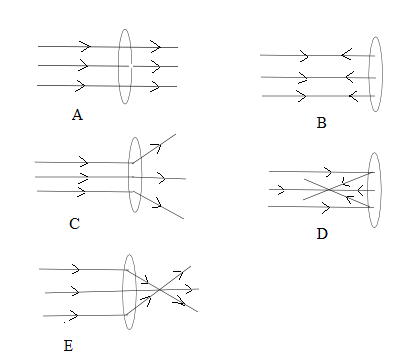 Which of the following diagrams shows what happens to the rays when they strike the lens? An object of height 10 cm is placed 50 cm in front of a bi-convex lens with a focal length of 20 cm. Which of the following is true about the image? An object of height 5 cm is placed 25 cm in front of a bi-convex lens with a focal length of 10 cm. What is the height of the image? An optical fiber is made up of a core of refractive index 1.6 and a cladding of refractive index 1.5. What is the maximum angle that the light rays can make with the axis of the optical fiber so that light is totally reflected inside the optical fiber? For an object in front of a plane mirror, which of the following about its images is(are) true? Light is an electromagnetic wave that can propagate in vacuum with a maximum speed of approximately 3×108 m/s. Light of any wavelength can be reflected and refracted. Light with a single wavelength cannot be dispersed. The ray refract toward the normal. A convex lens is a converging lens. Rays parallel to the axis of a convex lens will emerge through the lens and all pass through the same point called the principal focus. So di which is the distance from the lens to the image is positive, therefore the image is real and inverted and on the opposite side of the object. Let do be the distance from lens to object, di distance from lens to the image and f be the focal length. Let hi be the height of the image and ho be the height of the object. First use the lens equation to find di. To have total internal reflection, the angle of incidence i must be larger than the critical angle ic. The image of the object in front of a plane mirror is virtual, upright and of the same height as the object.